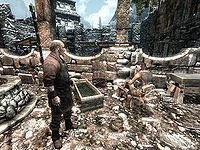 Oengul War-Anvil is a Nord blacksmith living in Windhelm. He can be found at the forge outside the Blacksmith Quarters, next to Windhelm's marketplace on the west side of the city. He works at the forge daily, along with his assistant Hermir Strong-Heart. If anything happens to Oengul, Hermir replaces him as the town's blacksmith. Oengul begins his day at 6am by having breakfast inside his quarters. Giving himself two hours for breakfast, he will then head outside to work at the forge for the next twelve hours. He will offer his merchant services during this period. At 8pm he will return inside for dinner, before heading to bed at 10pm. At 6am he will get out of bed, to start the new day. Oengul wears a blacksmith's apron along with a pair of shoes. He carries his key to the Blacksmith Quarters, a belted tunic, and a selection of common loot and gold. In combat, he relies on an iron warhammer. Oengul works everyday tirelessly, trying to outshine Eorlund Gray-Mane from Whiterun. 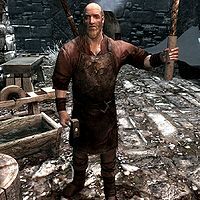 He will often remark: "Everyone says Eorlund Gray-Mane is the best smith in Skyrim. I plan to change a few minds about that." Oengul will additionally make remarks about how his weapons will help liberate Skyrim from Imperial control: "With my swords in their hands, Ulfric's men will send those legion dogs running." He may also ask you if you require any smithing done: "Need some metal hammered?" Besides those greetings, he will speak praises of the progress his apprentice has made: "Hermir's become a decent smith. Like to think I had a hand in that." Questioning him if his business has prospered thanks to the war will have him reveal he does not see his work as business, but a duty: "I don't see these troubles as business. This is a labor of honor. To bring Ulfric his rightful glory, I would hammer a thousand shields. Shor's bones, I might just have to!" If you ask him about his steel, he will reply: "Every bit as sharp as what you'll find in Whiterun. I respect Eorlund, but he has the good fortune to work the Skyforge. Something about the fires... their steel just holds tighter." When ending a conversation, Oengul will occasionally ask for you to support his business by either asking you to visit him when you need his services: "Whether it's armor you need or a new blade, come see me." or sending others his way if they might: "If you meet anyone in your travels who needs good steel, send them my way." He is a loyal supporter of the Stormcloaks, and Ulfric Stormcloak asked him to make a sword in an ancient style. Oengul is having a bit of trouble forging one and will ask you to find Queen Freydis's sword for him. Asking him if he is the castle's blacksmith when you have no other instance of the Dungeon Delving quest active will have him respond: "Of course I am. What do I look like, a tavern wench? Ah, don't let my words cut you too deep. I've just been working the forge too hard. Trying to set this sword right." Telling him to mind his manners the next time he speaks to you will have him respond, "Pfft. Ungrateful milk drinker." not allowing you to take up the quest. If you instead ask what is special about the required sword, he will explain "Jarl wants it to look like an ancient blade. High Queen Freydis ruled over Windhelm in the Second Era, and her sword was legendary. Getting the real sword would be even better than making a copy, but no one wants to risk getting it from its resting place. If you find that sword, traveler, I'd be grateful." Ending the conversation at this point will have him remind you of your unfinished task: "Don't forget. You find Queen Freydis's Sword, I'll reward you." After acquiring the sword for him, he will thank you by training you in Smithing: "Look at that edge. Still sharp. I'll present this to the Jarl later. As for you, let me show you some smithing techniques." If Windhelm falls to the Imperial Legion, Oengul will become resentful and will say when encountered: "Can't believe Ulfric's gone. If not for Hermir, I'd have left the city by now." If you ask him whether he'll stay in Windhelm, he will reply: "I almost didn't. I wasn't sure I could stomach having some Imperial tell me how to live my life. I was ready to pack my things when Hermir came to me. She wanted to make sure I'd finish teaching her the smithing trade. That girl's determination won me over. I suppose it didn't hurt that she said she only wanted to learn from the best smith in Skyrim. I couldn't let her run off to that pretender Eorlund Gray-Mane, could I?" He will say these things regardless of whether or not Hermir is still living. Oengul: "Did you use my good hammer?" Oengul: "Blast, girl, I told you to leave my tools alone. You have yours and I have mine." Hermir: "I didn't touch it!" Oengul: "Hammers don't have legs." Hermir: "Did you look behind the forge? I think I saw it there." Oengul: "Oh... yes. Now that you mention it, I think... sorry about that." Hermir: "Is Ulfric's armor done yet?" Oengul: "No, I want to take my time with it." Hermir: "Can I help with it? Maybe just the cuirass?" Oengul: "This is more delicate work than you're used to." Hermir: "I did that engraved piece just last month!" Oengul: "This is the royal armor, lass. Maybe in a few years." Oengul: "Have you been learning your ores?" Hermir: "I think I've got a handle on it, but Orichalcum is confusing." Oengul: "Don't even bother with that one. Leave it to the orcs." Hermir: "Oh, right. That makes sense. Kind of a messy metal, anyway." Hermir will also recommend you see Oengul as a greeting: "If you've need of weapons or armor, come back and see Oengul." She will on occasion talk about her luck to be trained by such a skilled smith: "I couldn't ask for a better teacher than Oengul." After returning Queen Freydis's sword to him, it will be available for you to buy. This page was last modified on 22 June 2014, at 09:34.